Northrop F-5E Tiger II (USAF Serial Number 74-1564) export fighter had been originally destined for delivery to South Vietnam and became available when the country collapsed. It was delivered in 1976 to the U.S. Air Force’s 64th Fighter Weapons Squadron at Nellis AFB, Nevada where it served as the Commanding Officer’s aircraft. It was transferred to the U.S. Navy and sent to the &quot;Desert Bogeys” of Strike Fighter Squadron 127 (VFA-127) at NAS Fallon, Nevada where it provided adversary training to Navy squadrons. 1564 served with VFA-127 until it was disestablished on March 23, 1996. It was transferred to the “Saints” of Fighter Squadron Composite 13 (VFC-13). The Saints assumed the adversary training role at NAS Fallon when the Navy relocated the Naval Fighter Weapons School, or TOPGUN, to NAS Fallon. This aircraft was struck from inventory in 2007. It is on loan from the National Naval Aviation Museum in Pensacola, Florida. The F-5 started life in the 1950s as a privately funded light fighter program by the Northrop Corporation. The aircraft was the first air force fighter designed for use primarily for smaller allied nations during the Cold War. The first generation F-5A Freedom Fighter entered service in the 1960s and by 1972 more than 800 had been produced. First flown in 1972, an improved second-generation F-5E, named the Tiger II, was used by numerous US allies, and to a limited degree also served in US military aviation as a training and aggressor aircraft. Due to its small size and performance similarities to the MiG-21, the F-5E was adopted as an opposing force “aggressor” aircraft by the US military in support of Dissimilar Air Combat Training (DACT). The Marine Corps purchased ex-USAF models in 1989 to replace the F-21A Kfir, which served with VMFT- 401 at MCAS Yuma. 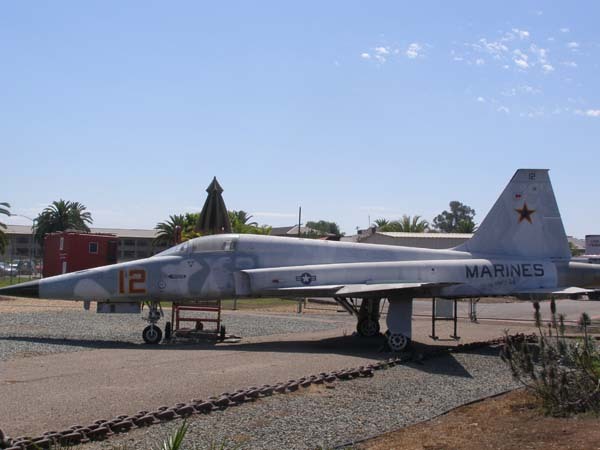 The Navy also used the F-5E extensively at the Naval Fighter Weapons School (TOPGUN) when it was located at NAS Miramar, California, and later at NAS Fallon, Nevada. Wingspan 28 ft. 0 in. Length 48 ft. 2 in. Armament: Two internal fixed forward-firing Mk-39 20-mm guns with 280 rounds each; two AIM-9 Sidewinders on wingtips; up to 5,000 lbs of ordnance carried externally on five hard points.